Welcome to our annual celebration of reading, the YISS 2017 Elementary School Read-A-Thon. Read-A-Thon is organized as a joint effort between the PTO and administrators at YISS. Our goal is to develop a lifelong love of learning and promote the enjoyment of reading through a variety of fun and educational activities. 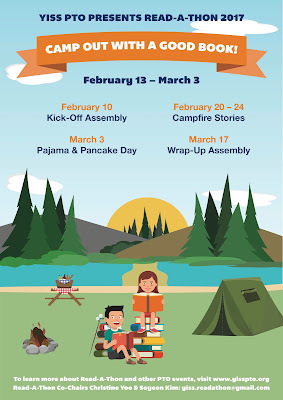 The theme this year is "Camp Out with a Good Book" and will begin on "Monday, February 13 and end on Sunday, March 5. We want to encourage our children to read joyfully. All the events for this year’s Read-A-Thon circle around the theme, and of course the competition for prizes will be highlighted as well. This year, we will remain focused on growing readers in as many ways as we can. We will continue to carry on some of our RAT traditions and enjoy some new fun as well! And yes... If the elementary school students can collectively read a total of 765,432 minutes Mrs. Willetts, Ms. Falkner and Mrs. Roll have agreed to a pie throw at the Wrap-Up Assembly! DEAR Time: 20 minutes of Every School Day has been dedicated as Drop Everything and Read (DEAR). DEAR time is for everyone to read, both adults and students in the school community. These 20 minutes count towards your reading log. We have included a column with the DEAR minutes for your convenience. Please add 20 DEAR minutes and “Minutes Read” to calculate daily totals in your child’s Reading Log (Refer to Reading Log). iii. Chance to be pie throwers, if ES can meet the school wide goal minutes of 765,432. All students and staff will be invited to submit a picture of themselves “Camping Out with a Good Book”. Pictures must be printed up and dropped off in the elementary office. Students may drop their entry off anytime between Feb. 13th and March 3rd. These pictures will be displayed outside the ES office and those individuals (students and staff) who submitted the best pictures will be awarded with a voucher for our Spring book fair in April. Everyone will have the opportunity to come and hear campfire stories. All students, teachers, and administrators will celebrate the end of Read-A-Thon and if the Elementary School collectively reads 765,432 minutes, Mrs. Willetts, Mrs. Roll and Ms. Falkner have agreed to the Pie throw at the Wrap-Up Assembly. In addition, names will be drawn for prizes. For any questions, please contact Elementary Read-A-Thon 2017 Chairs, Soyeon Kim & Christine Yoo, at yiss.readathon@gmail.com.